Download from over 6.5 million audio podcast episodes.Choose from over 88 thousand podcast in one of the largest audio podcast directories world wide. 1. 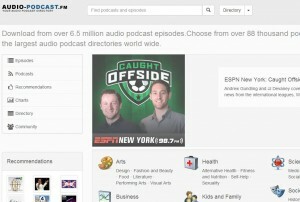 On the website, click on “Submit your podcast” at the buttom. 2. Fill out the form starting by pasting your podcast link. 3. Select 1-3 of your podcast category on the drop-down menu. 4. Put a check mark on the terms and conditions for podcast producers. 5. Input your e-mail address and the correct Captcha code.